Bangladesh go above the West Indies after annual update. Australia and New Zealand have swapped positions just below the top two. Sundar also make big gains in latest ICC T20I rankings after declared Man of the series in the Nidahas Trophy. Kagiso Rabada has become the fourth South Africa bowler to go beyong 900 rating points and is now once again the top-ranked player. 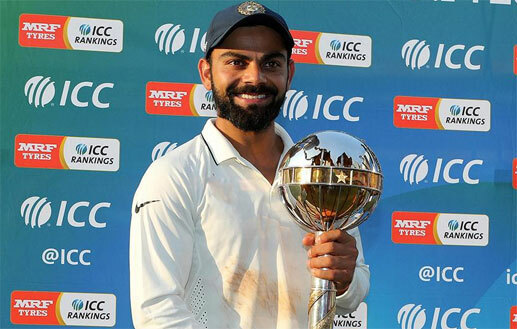 Virat Kohli received the ICC Test Championship mace after his side held onto top spot in the MRF Tyres ICC Test Team Rankings. Mohammed Shami, Bhuvneshwar Kumar and Jasprit Bumrah achieve career-high rankings. Australia have moved into third place while England have dropped to fifth position. Aussies captain continued his reign in ICC Player Rankings for Test Batsmen while Indian skipper finish top in ODIs and T20Is. Rahul, Rohit, Chahal and Kusal Perera among those to gain in latest update. Rohit Sharma moved up one place to number five spot in ICC rankings for ODI batsmen, Shikhar Dhawan 14th. Indian captain is the top-ranked batsman in both ODIs and T20Is. Anderson continues to be the top-ranked bowler. Career-bests for Raza; Masakadza, Holder and Dowrich among others to gain in latest rankings. Bumrah reaches career-best third position in bowlers list led by Hasan Ali. Sri Lanka now trails fifth ranked Australia (97 points) by three points. Australia and India had both started the series at 117 points with Australia ahead on decimal points. Mushfiqur, Sabbir, Mehedi and Mustafizur also move up. Australia is now on 97 points, the same as New Zealand, but is behind on decimal points. Virat Kohli equals the highest ODI rating points by an India batsman, recorded by Sachin Tendulkar in 1998. David Warner has returned to the top 10; career-best rankings for Tamim, Shakib; Stokes, Woakes and Cummins also move up. Australia must beat Bangladesh to retain fourth place in Test team rankings. Umesh Yadav, Pandya, Dickwella also reach career-high rankings in latest update; Chinaman bowlers Kuldeep Yadav and Sandakan move up too. Team pips Australia to third, raising the stakes for the Ashes tour later this year. SA lost seven rating points. Ashwin back to second position among bowlers; Pradeep, Maharaj attain career-best rankings. Bangladesh now lead eighth-ranked Pakistan by five points, while it is ahead of ninth-ranked West Indies by 14 points. Australia remain on second, while India replace New Zealand on third position and Kiwis slip to fourth. On Tuesday, India had retained the mace and pocketed $1 million following its 2-1 series win over Australia. Top-ranked Smith attains career-best rating while Pujara rises to career-high second place.